He was apprehended by members of Agbor Gha-Ihun security outfit at his hideout beside Camelite Paint, Agbor, Delta state alongside his accomplice, Mr. Sunday Kibechukwu (33) who acted as the kidnapper. The suspect while confessing to the crime said his intention was to force his wife to pay his demand, adding that he needed the money to boost his lottery/betting business (Bet Naija). He said he was retrenched as a security officer with UBA bank, Agbor last year and since then, he has been managing with the lottery/betting business while his wife who is an indigene of Mbiri Kingdom in Ika North deals in poultry business. According to him “I connived with Sunday to frame my kidnap in order to collect money from my wife because I needed it to boost my business with the intention of paying her back after my business improves. 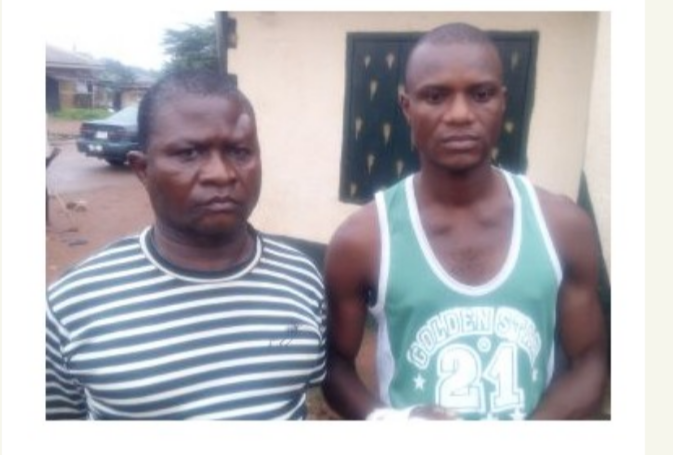 On his part, Sunday who hails from Aniocha North LGA of Delta State noted that Silver lured him into involving in the crime with a promise to return the money and also give him N10, 000 to treat the injury he sustained while working at a bakery in Boji-Boji Owa. It was gathered that the suspects after the kidnap had contacted Silver’s wife popularly known as Madam Rose, demanded a ransom of N1million and directed that the money should be dropped along Benin/Asaba Expressway at Umunede. In the course of negotiation, she pleaded to pay N300,0000 which they refused. But as God would have it, Silver was sighted at his hideout and was reported to Agbor Gha-Ihun who quickly moved to arrest the culprits. As at the time of filing this report, the suspects were still under the custody of the Security Operatives, Agbor Gha-Ihun.